A “game-changing development” set to get off the ground in the next few months could help propel Grand Bahama into a profitable year, according to chairman of the Grand Bahama Port Authority (GBPA) Ian Fair. A new water park, which will include marine attractions, is in the works for Grand Bahama with the Port Authority on the brink of finalizing negotiations with the developers and hoping construction can begin on the site within the first quarter of 2013. “This is going to be an amazing park,” Fair told the audience at the Bahamas Business Outlook last week, saying the project, in eastern Grand Bahama, was initally designed for cruise ship passengers, as a way of drawing them off the ships to explore the island. The GBPA chairman said cruise arrivals had increased by 29 per cent from 2011 to 2012. In the same timeframe, BORCO parent company Buckeye Partners invested $2 billion in its facilities and increased its petroleum storage capacity by 4.7-million barrels. In addition, there was a 10 per cent jump in container volume at the Freeport Container Port. He also pointed to recent investment in the island such as a $4-million Solomon’s Superstore, new businesses in the form of Senor Frogs and Sparkys, and upgrades to the international airport facilities. In 2013, GBPA hopes to welcome a new stem cell research centre and a new five-star resort at the Reef Village in Grand Lucaya, operated by Sunwing Travel Group. To encourage further investment the GBPA intends to increase its visibility internationally and has already sent trade missions to Panama, London, Australia, China and Hong Kong. 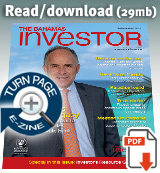 “Our goal is to inform targetted investors of the island. [We are doing] a complete overhaul of our messaging with a new brand identity to attract the right kind of investment,” said Fair. “As a nation we have to become innovative and think outside the box, as we plan our future.